The High Commissioner for Human Rights is extremely concerned about Nasrin Sotoudeh, an internationally recognised lawyer and human rights activist, whose health is reportedly deteriorating. Ms. Sotoudeh has been on hunger strike since 17 October as a protest against her prison conditions as well as a travel ban imposed on members of her family. She spent almost three weeks in solitary confinement and was deprived of family visits for several weeks after she began her hunger strike. Ms. Sotoudeh, the winner of this year’s prestigious Sakharov Prize for Freedom of Thought, was arrested on 4 September 2010, and is currently serving a six-year sentence in Tehran’s Evin Prison. She has also been banned from her profession for 10 years on charges that are believed to be linked to her work as a human rights defender. Since her arrest, her husband and 12-year-old daughter have been subjected to restrictions including the travel ban. The Iranian authorities claim that Ms. Sotoudeh is in a good health. However her husband, who was recently allowed to visit her, says her health has reached a critical stage. The High Commissioner urges the Government of Iran to urgently address Ms. Sotoudeh’s situation by lifting the travel ban and other sanctions on her family, which cannot be justified under international law. The UN human rights mechanisms view the imprisonment of Ms. Sotoudeh as arbitrary, and in violation of various provisions of the Universal Declaration of Human Rights and the International Covenant on Civil and Political Rights (ICCPR), to which the Islamic Republic of Iran is a State party. The High Commissioner is concerned that family members of human rights activists and lawyers are often targeted by the Iranian authorities. On 20 November 2012, a Revolutionary Court in Tehran sentenced Ms. Massumeh Dehghan, the wife of jailed lawyer and human rights defender Mr. Abdolfattah Soltani, to one year in prison, suspended for five years, coupled with a five-year travel ban. She was charged with propaganda against the system for travelling abroad and receiving the Nuremberg human rights prize given to her husband. The prosecution and imposition of sanctions and other limitations on human rights activists and their family members reflect a disturbing trend apparently aimed at curbing the freedoms of expression, opinion and association. The High Commissioner has urged the Government of Iran to promptly release Ms. Sotoudeh along with all those activists who have been arrested and detained for peacefully promoting the observance of human rights in the country. The rights to freedom of expression and opinion, and peaceful assembly are fundamental human rights which must be protected and respected. On another note, the execution rate has accelerated to an alarming pace in recent weeks. There are credible reports, in many cases corroborated by the government itself that the number of executions carried out between 7-20 November is at least 32, with some sources indicating the figure as high as 81. 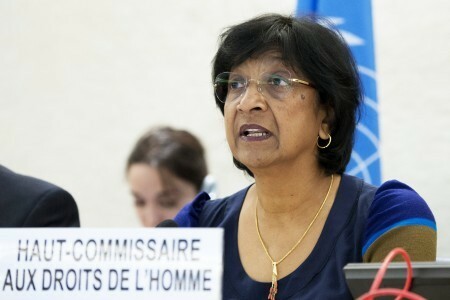 We are concerned about the increase and the High Commissioner in her opening statement to the 21 session of the Human Rights Council raised her concerns about an increase in drug-related executions and executions in public in Iran.